Starting today and continuing through the month, Crazy Pita will participate in a paper icon sales campaign collecting monetary donations starting at $1 for St. Jude Children’s Research Hospital. You can purchase St. Jude paper icons at any three of the Crazy Pita restaurant locations as a direct donation to the charity. Crazy Pita is dedicated to being a strong partner and supporter of the nonprofit organizations that serve our communities. St. Jude depends on individual donors for the majority of funding, which allows them the freedom to focus on what matters most – saving kids regardless of their financial situation. The mission of St. Jude Children’s Research Hospital is to advance cures, and means of prevention, for pediatric catastrophic diseases through research and treatment. Consistent with the vision of St. Jude’s founder Danny Thomas, no child is denied treatment based on race, religion or a family's ability to pay. 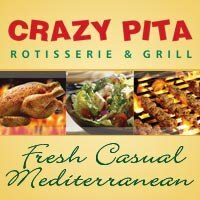 All donations made at any Crazy Pita during March will go directly to St. Jude Children’s Research Hospital.